Along with the cake making and general cooking I have several other interests, one of which is cycling. If you're not into the two wheeled thing then you may not realise that cyclists like nothing better than going out for a ride, exerting as much energy as possible (not a great deal in my case) and then collapsing in a café to eat vast quantities of cake. Of course there are many varieties of cake but one I hadn't heard of until I got into cycling was Chocolate Guinness Cake. One cycling friend of mine made a couple as her wedding cake and has said it the easiest cake she knows how to make. I would disagree with that as an all-in Victoria Sponge would top that category for me. However, I would say it is a very forgiving cake and one you can mess about with the quantities a bit. Being a non-drinker I've always been deeply suspicious of any alcohol in cooking as I can usually still taste it and that's the bit I really don't like! I put off making one until I had the pleasure of tasting one at a Clandestine Cake Club meeting. The addition of Guinness in this recipe though really brings out the flavour of the chocolate despite the relatively small amounts of cocoa in the recipe for the size of the cake. I don't like dark chocolate but I will go out on limb and say this is the most intensely chocolate flavoured cake I have ever eaten. I bought a 500ml bottle of Guinness for this recipe after deciding against the smaller Foreign Export at 7.5%! There's no reason why you shouldn't buy another brand of stout except in my case this was the only one my local supermarket was offering. I have heard that Newcastle Brown Ale makes an excellent alternative and gives it a sweeter edge. Other people have simply put in another beer of their choice. I have to say they all smell the same to me (revolting) so I couldn't really advise in this matter. As the recipe uses exactly half a bottle of Guinness you have a choice of what to do with the rest. Obviously you could just neck it but that isn't really an option for me. There is the option of making two because un-frosted it freezes well. My half bottle will though be going into a Beef, Bacon and Guinness Casserole to make the perfect St. Patrick's Day combo. The most famous Chocolate Guinness Cake recipe is by Nigella Lawson but I've added a few tweaks of my own. Sadly, the budget at Jibber Jabber Towers isn't as big as the one at Casa Lawson so my suggestions are of the penny pinching variety. I know Nigella wouldn't approve; in fact I reckon she would be horrified. However, I think if she had the choice of cake or no cake I'm sure that she would go for the cake option. As the original recipe was made 'famous' by Nigella Lawson and is of the chocolate variety I am putting this forward for this month's We Should Cocoa which is hosted jointly by Chocolate Log Blog and Chocolate Teapot. The guest host for this round is The KitchenMaid who has decided that the theme should be to share a famous chocolate recipe. You will need a 9in (23cm) round tin – I use a springform tin as it makes it easier to get the cake out of the tin. I also line tins with reusable non-stick liners so if you don't you will need to grease or use parchment paper. 9 fl oz (250ml) Guinness or Stout – Don't measure the head! 2. In a large saucepan pour in the stout and add the baking spread in small pieces (it makes it quicker and easier to melt). 3. Heat the mixture gently until the fat has melted and then add the cocoa and sugar. Stir in well. 4. In a separate bowl beat together the yogurt, eggs and vanilla. Add this mixture to the large saucepan along with the flour and bicarbonate of soda. 5. Give the mixture a good beat so all the ingredients are combined. It should look like the thickest, most indulgent hot chocolate you would ever want to drink. 6. In the prepared tin pour in the mixture. Remember this has a lot of liquid in it so it will be more of a batter rather than something you can spoon into the tin. 7. Cook for around 45-55 minutes. Once baked due to the moistness of the cake leave in the tin to cool completely but place the tin onto a wire cooling rack. 8. Once the cake is cold prepare the topping. 9. In a large bowl beat the cream cheese with a fork so it becomes quite loose and smooth. 10. Sift the icing sugar unto the cream cheese and beat together well until all the icing sugar has been combined. 11. Place on top of the cake and start to smooth all over the top until there is an even layer. 12. Due to the cream cheese topping this cake will need to be stored in the fridge. I have substituted some ingredients from the original recipe and left others entirely. This is how much I have saved. Prices quoted are as shown on sainsburys.co.uk on 16 March 2013 (Sainsbury's is my local supermarket so that's why I chose it). The eggs I bought from Iceland have been priced at £1.00 all of this year. Difference £1.86 plus yogurt left over (it's going in a quiche). It will just be the name that Sainsbury's has dreamt up for them to make it sound more appealing. They're just the standard free range eggs that Sainsbury's sell. The Basics eggs are barn one which isn't bad as they have stopped selling any eggs from caged hens. What a shame. I was already thinking about doing that cake today, but then I came to the point where it says cream cheese and ... I don't have any and can't get any today. So it's most likely 'no cake'. Perhaps you could a buttercream instead if you have butter and icing sugar. Alternatively you could whip some double or whipping cream to put on top. This could be flavoured with some icing sugar or vanilla extract beaten in. Now I have the cream cheese, but I have to do without the yogurt. You need to make a shopping list, Christian! I've made a few beer cakes and as a non beer drinker myself, it does work surprisingly well. I have not yet made Nigella's famous recipe but I have eaten a slice or two. We've not had it yet at our CCC though, something that obviously needs to be rectified. 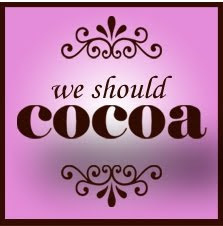 Thanks for entering this into We Should Cocoa.